"UT/TT Poll: Texans Skittish About Domestic Use of U.S. Military" was first published by The Texas Tribune, a nonprofit, nonpartisan media organization that informs Texans — and engages with them — about public policy, politics, government and statewide issues. Texas voters think Gov. 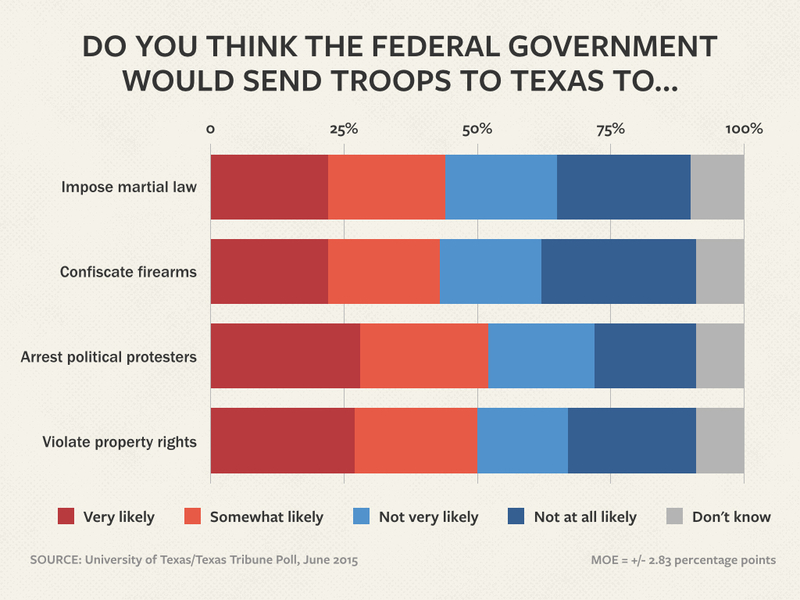 Greg Abbott was right to send the Texas State Guard to monitor U.S. military exercises here, and they consider federally ordered domestic military intervention likely under certain circumstances, according to the latest University of Texas/Texas Tribune Poll. Abbott sent the Texas State Guard to monitor the so-called Jade Helm 15 military exercises in Central Texas earlier this year, after particularly vocal activists expressed fears that what was being billed as an exercise was actually something far more sinister. “During the training operation, it is important that Texans know their safety, constitutional rights, private property rights and civil liberties will not be infringed,” the governor wrote in his letter to the Guard’s commander at the time. While a third of the registered voters in the poll had no opinion about the governor’s action, 39 percent agreed with it and 28 percent opposed it, the poll found. More to the point, it was popular with a particular group — Tea Party Republicans who were paying attention to the issue, 85 percent of whom agreed with Abbott. “This is an action that played to a very specific audience,” said Jim Henson, head of the Texas Politics Project at the University of Texas at Austin and co-director of the poll. Texas voters’ suspicions about the federal government and its use of the military don’t stop at war games, the survey found. Asked whether federal military intervention is likely in certain circumstances, large numbers said yes. A majority said military intervention is “very” or “somewhat” likely to arrest political protesters, and 50 percent said it is likely that the feds would send the military to violate citizens' property rights. Smaller but significant numbers said the military would likely be used to impose martial law (44 percent) and to confiscate firearms from citizens (43 percent). “You put federal government into it and people’s skepticism and their concern really rises,” said Daron Shaw, co-director of the poll and a professor of government at UT-Austin. He noted that a substantial number of Democrats — 31 percent on the martial law question — believe federal military intervention is possible. Republicans were more likely than Democrats to say the government might send troops in those situations, but those concerns don’t always obey party lines. Two-fifths of Democrats think the feds would come to break up political protests, for instance, while only 25 percent think the military would be sent to confiscate guns. Among all of the subgroups, Tea Party Republicans were most likely to say the government would use the military inside the United States. The conservatives were more intense about it, but they were hardly alone. Some of that, Henson said, has to do with the current political order. The University of Texas/Texas Tribune internet survey of 1,200 registered voters was conducted from June 5 to June 14 and has an overall margin of error of +/- 2.83 percentage points. Numbers in charts might not add up to 100 percent because of rounding. This is one of several stories on the latest University of Texas/Texas Tribune Poll. Previously: The presidential primaries, guns and discrimination, the mood of the state, and gay marriage and other social issues. Also today: Taxes and other legislative issues. UT/TT Poll: Texans Skittish About Domestic Use of U.S. Military By Ross Ramsey June 25, 2015 Texas voters think Gov. Greg Abbott was right to send the Texas State Guard to monitor U.S. military exercises here, and they consider federally ordered domestic military intervention likely under certain circumstances, according to the latest University of Texas/Texas Tribune Poll. Abbott sent the Texas State Guard to monitor the so-called Jade Helm 15 military exercises in Central Texas earlier this year, after particularly vocal activists expressed fears that what was being billed as an exercise was actually something far more sinister. “During the training operation, it is important that Texans know their safety, constitutional rights, private property rights and civil liberties will not be infringed,” the governor wrote in his letter to the Guard’s commander at the time. While a third of the registered voters in the poll had no opinion about the governor’s action, 39 percent agreed with it and 28 percent opposed it, the poll found. More to the point, it was popular with a particular group — Tea Party Republicans who were paying attention to the issue, 85 percent of whom agreed with Abbott. “This is an action that played to a very specific audience,” said Jim Henson, head of the Texas Politics Project at the University of Texas at Austin and co-director of the poll. “Despite the criticism that Gov. Abbott took from the national press and from his political opponents, he was pretty much in the comfort zone of his political base, in both taking this action and in the way that he took it,” he said. “There’s no evidence here that he should expect any backlash in Texas.” Texas voters’ suspicions about the federal government and its use of the military don’t stop at war games, the survey found. Enlarge Emily Albracht . Asked whether federal military intervention is likely in certain circumstances, large numbers said yes. A majority said military intervention is “very” or “somewhat” likely to arrest political protesters, and 50 percent said it is likely that the feds would send the military to violate citizens' property rights. Smaller but significant numbers said the military would likely be used to impose martial law (44 percent) and to confiscate firearms from citizens (43 percent). “You put federal government into it and people’s skepticism and their concern really rises,” said Daron Shaw, co-director of the poll and a professor of government at UT-Austin. He noted that a substantial number of Democrats — 31 percent on the martial law question — believe federal military intervention is possible. Republicans were more likely than Democrats to say the government might send troops in those situations, but those concerns don’t always obey party lines. Two-fifths of Democrats think the feds would come to break up political protests, for instance, while only 25 percent think the military would be sent to confiscate guns. Among all of the subgroups, Tea Party Republicans were most likely to say the government would use the military inside the United States. The conservatives were more intense about it, but they were hardly alone. “It cuts into everybody’s suspicion,” Shaw said. “Nobody trusts the federal government. About a third of Democrats are concerned about the government going nuts. Among Republicans, it’s between 55 percent and two-thirds.” Some of that, Henson said, has to do with the current political order. “What we’re picking up here are feelings ranging from skepticism to outright hostility toward the federal government on the part of many Texas Republicans,” he said. “It's hard not to think that Republicans' extremely unfavorable views of President Obama further fuel these feelings.” The University of Texas/Texas Tribune internet survey of 1,200 registered voters was conducted from June 5 to June 14 and has an overall margin of error of +/- 2.83 percentage points. Numbers in charts might not add up to 100 percent because of rounding. This is one of several stories on the latest University of Texas/Texas Tribune Poll. Previously: The presidential primaries, guns and discrimination, the mood of the state, and gay marriage and other social issues. Also today: Taxes and other legislative issues. Disclosure: The University of Texas at Austin is a corporate sponsor of The Texas Tribune. A complete list of Tribune donors and sponsors can be viewed here. Reference UT/TT - June 2015 - Summary (651.6 KB) DOWNLOAD Reference UT/TT - June 2015 - Crosstabs (1.1 MB) DOWNLOAD Reference UT/TT Poll - June 2015 - Methodology (66.3 KB) DOWNLOAD "UT/TT Poll: Texans Skittish About Domestic Use of U.S. Military" was first published at by The Texas Tribune, a nonprofit, nonpartisan media organization that informs Texans — and engages with them — about public policy, politics, government and statewide issues. Link back to the original article, which is located at https://www.texastribune.org/2015/06/25/uttt-poll-texans-wary-domestic-use-military/.